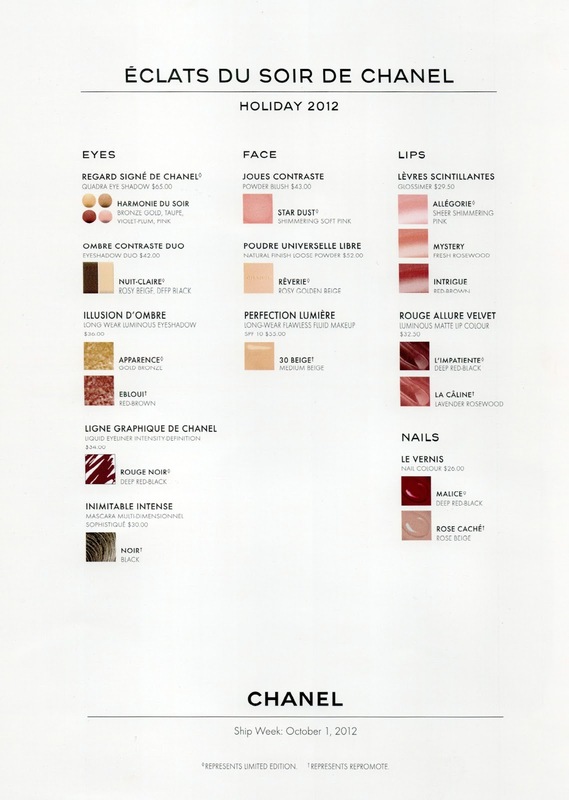 Intrigued by the alchemy of precious metals, Peter Philips, Creative Director of Chanel Makeup, debuts a resplendent Holiday 2012 collection: ECLATS DU SOIR DE CHANEL. Gold and bronze shade harmonies dust eyes with festive shimmer, while soft beige, pinks and deep reds set face, lips and nails aglow. This collection should start shipping to all stores starting the first week of October 2012. This season's eyeshadow palette is at once a gift, a jewel and the ideal accessory. 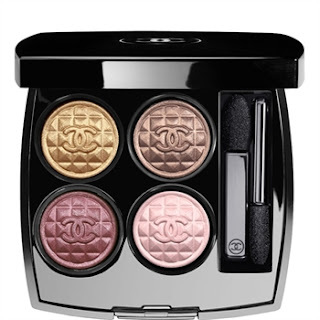 Embossed with a quilted effect and the CC monogram, each powder eyeshadow is reminiscent of the classic Chanel jacket button. 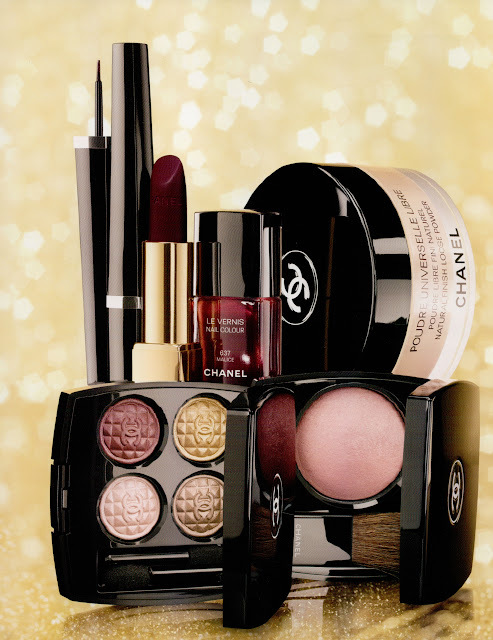 Deep, dense bronze-gold with a radiant sheen complements colours from violet-plum red to smoky taupe to pink, for the definitive look of holiday glamour. This foolproof pairing of complementary shades — in two unique textures — is housed in one convenient compact. The softly shimmering light shade is a creamy powder, which can be worn alone for a luminous effect, or as a base to extend the wear of the accompanying deep-toned shadow. The dark shade has intense micronized pigments for true colour application, and a matte finish to create depth and contour. Two applicators are included: a foam-tip to apply the shadows and a brush to blend. 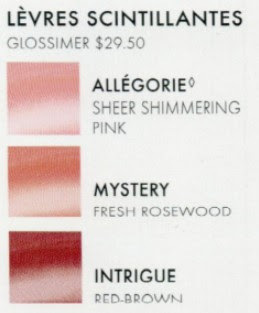 Available in six essential shade harmonies designed to take the guesswork out of harmonizing and applying eyeshadow. This intensely shimmering long-wear eyeshadow offers true versatility. 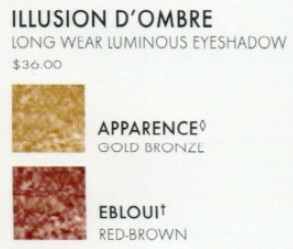 An innovative gel texture that is both soft and cushion-y allows it to be worn as eyeshadow or eyeliner. Includes a specially designed shadow/liner brush, developed specifically for this unique formula. Red-black colour defines the emblematic look of holiday splendor. Delicate pink highlights cheeks for a festive glow. New peach shade lights the face with an incandescent warmth. Effortless to apply, with seamless blendability for a naturally flawless effect, this breakthrough foundation is the ideal all-day, everyday formula – suitable for all skin types in a diverse range of 20 shades. Gorgeous shimmer and a high-shine glow is delivered effortlessly to lips with just one stroke of this best-selling lipgloss. A wide range of shades, from sheer and natural to sparkling and rich, look beautiful on their own, or over your favorite CHANEL lipstick. Equally beautiful: the conditioning formula's comfort and long wear. 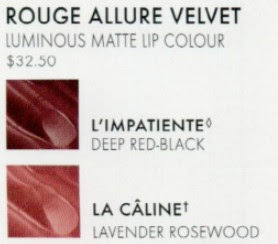 Bold and intense with a matte effect, deep burgundy or velvety pink gives lips luxurious colour. 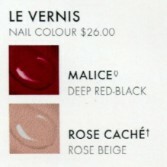 Soft rose beige dresses demurely for day, and deep red with black reflections goes all-out for night. I am drooling over the quad (gross I know) Ha Ha! I love it and I expect to see it sell out rather quickly. 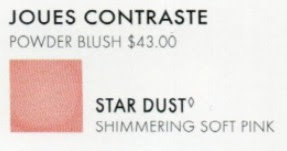 I'm thinking about getting the blush as well but I want to see how pigmented it really is and if it has a lot of shimmer / glitter to it. Hopefully it doesn't but we will see soon enough!